Whatever are Powerberries? Let me tell you, I've eaten an entire bag and I'm still not quite sure. But I can tell you this: they're covered in dark chocolate. The bag declares that the centers are made of "real fruit juice pieces." Right. So they are "pieces" of "fruit juice" covered in dark chocolate. But just for fun, turn to the person nearest to you and tell them you'd like a piece of fruit juice. I suppose there's a slim chance you have cubes of frozen juice in your freezer for some reason, and the person you've just asked for a piece of fruit juice will give you one of those frozen fruit juice cubes. But barring that unlikely situation, my guess is you'll just get a dumbfounded look. As strange as it may sound, I still cannot deny the fact that I have just consumed a bag of "fruit juice pieces" covered in dark chocolate. Fruit juice pieces are soft, slightly chewy, and very sweet. They're not liquid. They're more like gelatin. For anyone who's been reading this blog for a while, you'll know I like sweeter chocolates more than dark chocolates, but the overwhelming fruitiness in the center of these snacky spheres offsets any bitterness in the dark chocolate. Sonia and I both bit Powerberries in half, attempting to get a better look at the perplexing centers of these confections. The middles are dark, with some highlights, and there's something jelly bean-esque about them. 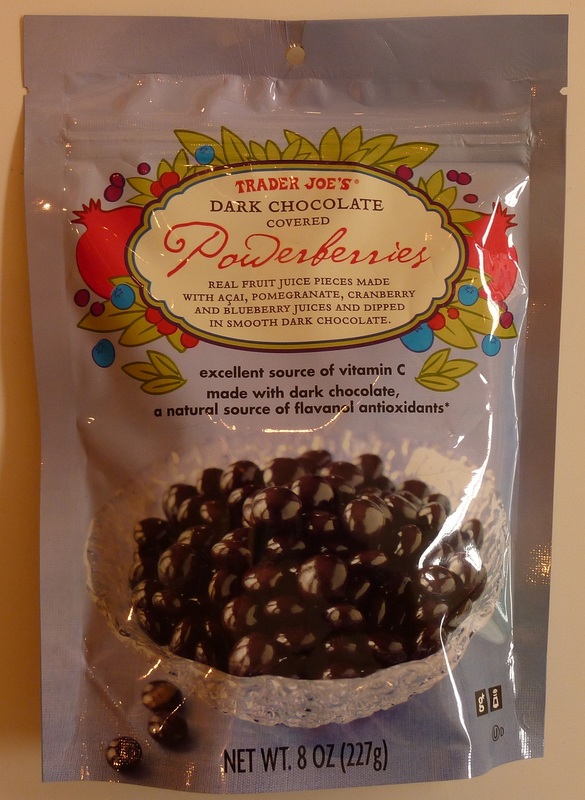 The overall taste of the Powerberries is not unlike a cherry cordial. But there's also something about them that reminds me of a truffle. They're like the illegitimate love-children of a truffle and a cordial. And yet I think they're a smidgen less caloric, thanks to fruit juice taking the place of traditional sugar and corn syrup. They're unique. And they're going to score at least two stars from me just for the weirdness factor. They get another star thrown on top of that for their good flavor. And they'll get another star for being healthier (or "less bad-for-you," if you prefer) than traditional chocolate candies. So I'll give them 4 stars. I can't go much higher than that because I'm just not in the habit of eating chocolate candies, and I can't feature myself buying these on a regular basis for any reason. Sonia will follow suit, adding that they'd be better if they had actual berries of some kind in their centers. oh, this makes me so sad! i love these little guys and have to show major constraint not to gobble them down twice a day. i give them a 10! 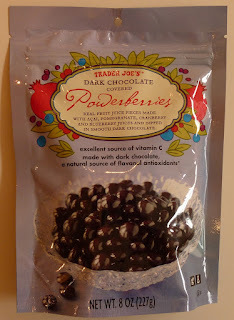 ps - you can get these packaged by the original distributor at cosco, sam's or bj's as brookside chocolate covered acai with blueberry, pomegranate or gogi with raspberry. the acai is the same as the tj's powerberry!! 7 is a respectable score on our blog! :) We liked them for sure...we're just not chocolate candy people. Thanks for the info about other places to buy these! I like to make my own trail mix with the mini peanut butter cups trail mix, pistashios, extra almonds, cherries and these. This way you get one or two per handful and it's perfect. This review (and many others) would be a lot less 'mysterious' if you just included the ingredients in your is. Why do you always cut them out? I'd rather see the list than the contextless "Nutritional Facts." I agree with Noel- 10 from me, as well! These things are amazing and addictive. I refuse to buy them because I can easily put down an entire bag. I actually have frozen cubes of orange juice in my freezer. My life is an unlikely situation. Miranda, that's a great idea to use these in trail mix! To honor all of the readers' 10-star scores, Sonia and I have, for the first time ever, modified and upgraded this product's score from the "not bad" category to the "really darn good" category. Oh, and Trader Joe's covers everything in chocolate. I find it strange that you're not chocolate candy people if you shop at Trader's. Not bad, but strange. Hey, in a little under a year's time, they've decreased the sodium content by 10mg! It now contains a 40mg per serving (same serving size). Interesting. Has anyone noticed a change in the once delicious power berries consistency within the last two months? They're no longer chewy/gummy :( What was once ranked a 10 in our book, is now a 5. Truth be told, I haven't bought these since the review. But that's a shame if they've changed them, astension. I thought these were really good. They are aweful now! I'm so bummed! Bought a bag yesterday and I want to throw them out. The lady said they stopped making them for a while because they couldn't keep up with the demand. Perhaps they found a quicker way to produce them! However much less satisfying! I used to love these but I agree whoever the company is using as it's new supplier really ruined the product. Now they are covered in a cheap waxy chocolate that crumbles in your mouth and the centers aren't nearly as good either. I used to be addicted to them now I won't buy another package! I was told the old vendor couldn't keep up with demand, but at least they were worth waiting for! The formula has changed for the Powerberries. They are really like eating chocolate covered sugar now..... no fruit middle at all! Yes, they weren't exactly good for you before, but now, not even tasty.